I the previous post I have described how easily is to create ResourceDictionaries from svg fils. Today I would like to inform you that the ResourceDictionaries improvements from ReaderSvg have also come to ReaderWmf library. This means that creating ResourceDictionaries from metafiles (emf, emf) files have been greatly improved too. This improvement has been also added to ResourceDictionaryWriter that comes with ReaderSvg. 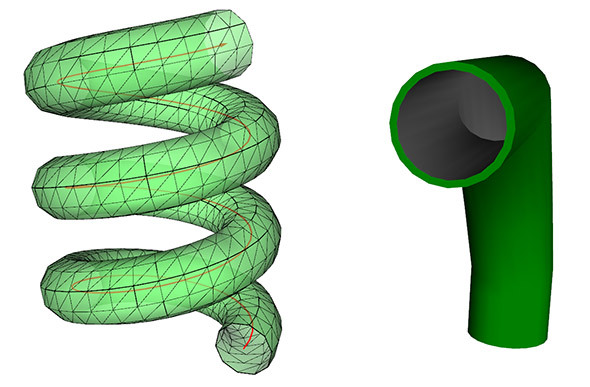 After a series of improvements of 2D products I will now devote more time to 3D products again. I am happy to announce that I have just released a new major release of Ab2d.ReaderWmf library. 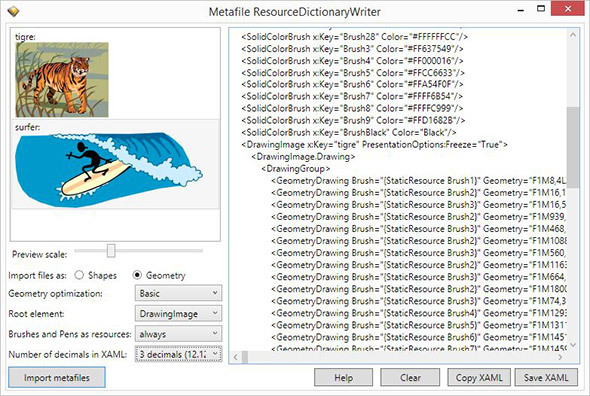 This adds some great new features to the best metafile importer for WPF. But the results were quite far from the original colors. Improved reading geometries when rectangle or ellipse have both Canvas position (Canvas.Left or Canvas.Top) and transformation set. Improved xaml writer to prevent writing Canvas.Left = "0" and Canvas.Top = "0" (zero values can be skipped). Prevented writing "Canvas.Left" and "Canvas.Top" properties in XAML two times. Added IgnoreRootElementSize property to GeometrySetting - added possibility to remove the transformations or RectangleGeometry based on the size or root element. Fixed problems where some separate lines were connected with additional line but they should not be. Prevented throwing "The method or property is only available in Professional version!" under some circumstances. Fixed not showing some texts under some circumstances. I am happy to announce that a new version of Ab2d.ReaderSvg and Ab2d.ReaderWmf have been published. I am particularly proud of adding some very interesting hierarchy optimizations to ReaderSvg. Drawings in svg files are many times defined in many groups and with using transformations. In case you do want to simply show your vector assets, than it is much more convenient to have the drawing objects compact and without the complex hierarchies. With the new version of ReaderSvg this is not very easy task. More about that later in this post. Clip path now works on all elements and not just on Canvas. Improved size measurement when AutoSize is set to true and some objects are hidden. Improved transforming read objects with calling Transform method. Updated SvgBounds after calling Transform method with updateLastReadViewbox set to true. Prevented throwing exception in GetObjectsWithCustomProperties when svg file does not have any custom properties. Added IgnoreRootElementSize property to GeometrySetting - added possibility to remove the transformations or RectangleGeometry based on the size or root element. This can produce nicer XAML. Fixed using transformations on EllipseGeometry and RectGeometry when reading svg file as geometry. No more transformations. Instead the values of the shapes were transformed to give us clean and simple object model. Note that when the Canvas defines the clipping area, than even when FlattenHierarhy is set to true, this Canvas is preserved. This way the end results are still the same as with having the whole hierarchy. In the same fashion, the TransformShapes could preserve some RenderTransforms. This happens when it is not possible to preserve the object with only transform the object’s values – for example if Ellipse or Rectangle is rotated with RenderTransforms, then we cannot preserve this rotation without using transformation (with Ellipse and Rectangle we can only change the position and size). I am sure that those new features are great for anyone that wants to use vector assets instead of bitmap. I think that using vector assets is the future. They have many advantages over bitmaps. For example they are DPI independent and can be scaled up and down without any loss. They usually take less space on disk. They can be simply manipulated – for example if you want that one icon changes color when the mouse is over it, this can be done with simply changing the Stroke or Fill color. With bitmap you need to use provide the bitmaps in all possible colors. Therefore I am already working on a new application that will allow users to simply create ResourceDictionaries with many vector objects created from svg or metafiles. The application will allow the user to optimize and transform the objects before they are added to ResourceDictionary. For example it will be possible to create vector assets that will all have the same size and the same padding regardless from which source they are created. And what is more, the application will be available with full source code. At the end of this post I would like to remind you, that the XAML that is created with our converter applications (ViewerSvg and Paste2Xaml) are not meant only for WPF. They can be also used for Silverlight and also for Windows Phone and Windows Store apps. All products on AB4D.com are 20% off until the end of December 2013. This makes December the best time to buy new products or renew the license. Even if your license is not close to expiration yet, it is worth buying a renewal now and get additional year of free upgrades and priority support. reader libraries and viewers will be sold only as pro licenses (no more basic licenses). The Ab3d.PowerToys library has been improved many times in the last years and now has really a lot of features. With the latest version the library also got obj file reader so it is possible to import 3D models from obj files. This means that in most cases you do not need the Ab3d.Reader3ds library any more (see the previous blog post for the differences between 3ds and obj file to check if you still need 3ds files). Another change related to this price increase is that it will not be possible to buy both Ab3d.Reader3ds and Ab3d.PowerToys for the price of Ab3d.Reader3ds + 1 USD (getting Ab3d.PowerToys for 1 USD). After 1st January you will still be able to get both libraries with discounted price, but this time the discount will be 30% of the total price. Another licensing change is that from 1st January 2014 on only Pro version of reader libraries and viewers will be sold. This means that it will not be possible to buy basic version of Viewer3ds or basic version of Reader3ds. The reason for that is that very little basic licenses were sold and that this concept added quite some confusion when potential customer tried to decide which version to buy. So from 1st January on instead of 4 types of licenses only 2 types will be available: one with viewer only (Viewer3ds, ViewerSvg or Paste2Xaml) and the other with library license (Ab3d.Reader3ds with Viewer3ds, Ab2d.ReaderSvg with ViewerSvg, Ab2d.ReaderWmf with Past2Xaml). So to conclude in a better tone, I would just like to say that the Ab3d.PowerToys price increase is just another very good reason to buy the license renewal now. New version mainily include some bug fixes and improvements that were created based on users feedback. Fixed reading text with gradient fill or stroke brush. Prevent throwing exception when incorrect number text was used for numbers. Invisible objects (Visibility != Visible) are not exported to geometry any more. Shapes with Opacity set (Opacity < 1.0) are now correctly exported as geometries. Added reading images from EMR_ALPHABLEND records. Note that usually those images are not rendered correctly because the blend dwRop operations are not supported by WPF, but at least user can get the image and convert it manually to a transparent image that could be used to achieve correct results. Added ResolveBitmapOperation that is called in processing EMR_ALPHABLEND record - here the user can change the bitmap to get correct results - for example convert black to transparent. Small fix for a problem that can occure when one object has multiple materials assigned. Improved reading broken files - no exception is thrown when the animation data for camera is broken. You could say that this is not much for quite a long time since last update. And you would be right. The reason for that is that I am preparing a new major release of Ab3d.PowerToys which will be hopefully ready until beginning of the next week. It will have much much more to show. And that is not all. With the release of the new version of Ab3d.PowerToys I will also announce a brand new project that I have been working on for almost a year. I am very excited about that project and I am sure you will also like it.